It sometimes feels very annoying when things doesn’t go the way we want it, like if you want to delete a program in MAC and it manages to couch itself in trash bin but we unable to empty the trash. Now that’s called a stubborn baby, sorry stubborn trash bin. Not to worry as we’ve got a solution for this and like always we have a procedure for this too by which we can succeed in emptying the trash bin completely in your MAC. Now, after clicking on “empty trash”, if you get a dialog box which says “trash contains locked items” then either you try remove or try to unlock them or else hold the “option key” then click on “special menu” and “empty trash”. 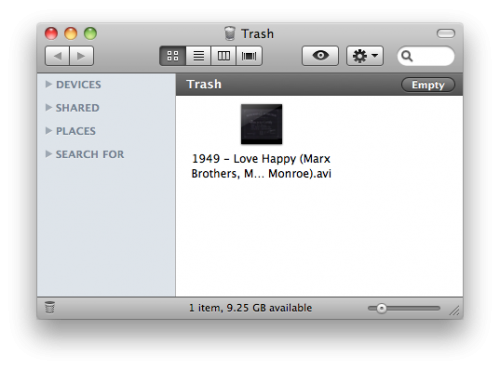 If trash still remains to be stubborn and doesn’t empty up the restart the MAC and try the “empty trash” again. If then too it fails to empty, then launch “terminal” application from your applications utility folder. Now, after clicking on “terminal”, a new window will be opened which will give information about the last login. Just below that you will find that a trash tag of “ m -rf ~/.Trash/* ” tag is added at the end and after entering this tag hit enter button from your Keyboard. 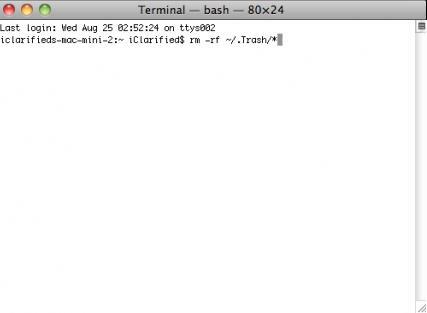 Now, you have successfully trashed the contents of the trash bin in your MAC, all it took was few simple steps. 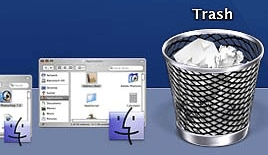 This trick or tip is very helpful and is the simplest as you didn’t even required a separate tool or a software for forcefully deleting the trash contents from the trash bin.